Having walked past this store plenty of times, it was only fitting that I cave and taste the dleights of all the wonderful aromas emanating from the store. 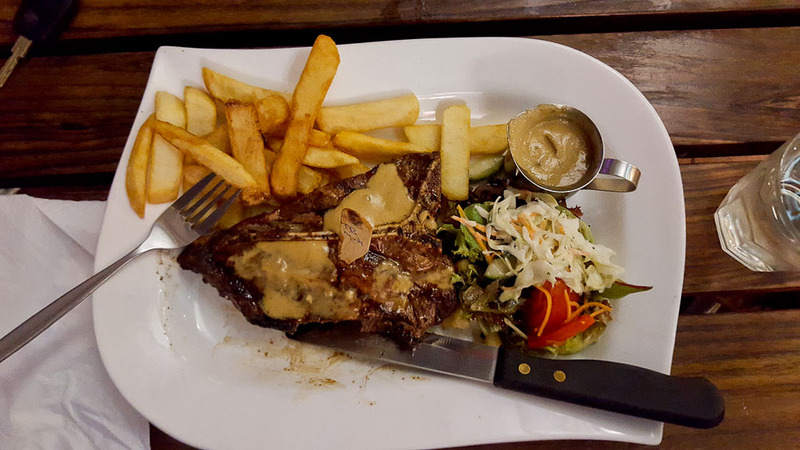 Outback Jacks is a wonderful chain of stores that is dedicated to recreating the Australian style of eating. Serving your traditional fare of Chicken Parmigiana and all the way to fish and chips (yes I know, those dishes being totally Australian are in doubt but hey, we have a habit of doing that and we aren’t about to change either), it’s the way they cook their steaks that really ensures that you’re in for a great meal. I chose the T-Bone with mushroom sauce. And this great dish came with chips and salad. Now what I found interesting waa that the chips are something to write home about. I couldn’t pin point exactly what that was. But the chips were fluffly, soft and warm on the inside and nice and crunchy on the outside. To top it off the salad and the dressing was well balanced with a delectable tang that made it light and crunchy. And finally, the medium cooked steak. For a steakhouse, perhaps if I had gone to it first, I would have thought differently but it just didn’t quite stack up to either squires or the local pub near me. Having said that, the steak was delicious and I did devour it quickly. The service was good and I found our waiter to be quite attentive in comparison to the other staff on hand that night.